Discussion in 'Java Update' started by Joe, 30/3/19. High-level IT Developers often face the most basic problem that demands them to make some crucial decision which could severely impact their development: Concurrency or Parallelism. And it's clear that Concurrency is NOT Parallelism. - To CONCUR means to work together, to cooperate, to pay attention to each other. - To PARALLEL is working independently, side-by-side and alone among each other. Working-together demands more harmonization, more synchronization among each other than working-alone-side-by-side. Modern Object-Oriented Programming Languages (OOPL) do offer some mechanism to cope with the demand for concurrency and parallelism programming. However, only C/C++ or C# gives developers genuine and direct accesses to the underlaying Operating System (OS): Thread and CPU-Affinity. Please don't start to protest loudly. Java or Python does let developers work with threads. But CPU-Affinity? First, what is it, CPU-Affinity? Affinity is the proneness to something. If you love "eating steak" you have "Steak-affinity." Java or Python or Ruby doesn't give developers any possibility to access directly to a certain core (CPU) of a multicore processor. First, we have to distinguish Thread from Task. A Task is a process which has its own working environment (e.g. memory, stack, etc. ), and Thread is a "reduced" task, or a simplified subtask, which usually shares its environment with the main task or other subtasks. A Task or process can run multiple Threads (e.g. event-listeners) which should "ideally" run along and parallel to parent process. Every IT developer has soon or later to work with thread. A Thread is a simple subtask that runs along and inside the main task. So far, so good with a thread. What's about multiple threads? As long as each thread won't interfere the main task, or other threads, or they don't have to compete or to concur with the main task or other threads everything works fine. What happens when threads work on a same area (objects)? They compete against each other for the use of this common area. If two or more threads concur at the same time (simultaneously or concurrently) and try to work on the very same object the result could be unpredictable and becomes unreliable. Or in other words: the result is falsified. I am talking now about Concurrency Programming. C/C++ and C# are more or less OS-dependent and less standardized than Java or Python. Because Java and Python are popular, more standardized and OS-independent I decide to focus on JAVA which is in my opinion more versatile than PYTHON and, especially, PYTHON's threading mechanism is not as efficient as JAVA. Hence Concurrent or Parallel Programming in PYTHON is quite a tricky work. First, let scratch a bit deeper under the skin of PYTHON. As we know, PYTHON is an interpreting OOPL. But PYTHON uses Global Interpreter Lock (GIL) to manage the concurrent threads and to make them "thread-safe", though, at the cost of real Multithreading and Parallelism. In essence and from this perspective Python is not truly multithreaded. So, now what? Python has to look for "supplier" who helps it to overcome the multitreaded problem. The solution is found in Greenlet (a spin-off of CPython's Stackless). Greenlet package (click HERE) for more details allows Python developers to work with multiple "Micro-Threads" called tasklets which run pseudo-concurrently (typically in a single or a few OS-level threads) and are synchronized with data exchanges on “channels” (quote). 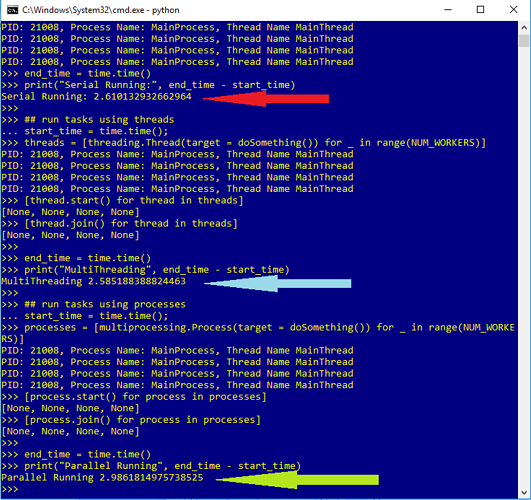 Now let compare serial-running tasks versus multiple threads and parallel-running tasks. We define 4 tasks (or processes) and 4 threads. You can split the Python codes into 3 different scripts, for example, SerialTask.py, MultiThread.py and ParallelTask.py and check for yourself the results. If you have more specific interest only on Python Concurrent & Parallel Programming you can consult this SITE toptal or simply surf to Python.org. Let try in Java. Different to Python Java sources must be compiled before they could be run. Again, the gain is insignificant. Why that? The answer lay back in the past: JVM up version 5 supports Concurrency to support multicore Processor and JVM's smart and efficient enough to exploit the available cores and to balance the last between the cores. How? A brief explanation: Instead of each JVM per core Java runs a single GLOBAL JVM and uses threads to to bind the cores and tries to distribute the last equally among the cores. Or in other words: "JVM uses a global scheduling technique, assuring at all times that the N highest priority threads in the Java application are running on the N available processors." (More: Multi-Core in JAVA/JVM or THIS). If objects are shared by threads they have to be synchronized in order to keep their state consistent and reliable. In this case the results of concurrency and parallelism will be significantly different. From this point of view Java Concurrent & Parallel Programming is very "verbose" compared to Python, but the process is much faster (more than 60x faster) and more authentic. Yes, Python is an easy-to-learn OOPL thanks to its simplicity, but at the expense of Error-Handling (very confusing for newbies), "pseudo" concurrency, incompatibilities between versions, 3rd party API-package dependency and Performance (slow). Further: the purpose of Multiple Threads and Parallelism is to enhance the performance and to reduce the processing time. What we see within Python's multiprocessing and threading package is not very encouraging. The gain is negligible. If you so will, Python is best for single processing (which is usually the case for a quick-and-ready-to-run solution, for example, in Machine Learning). However, business applications are more complex, more demanding than "simplicity" or "easy-to-learn". For example, Banking DB-transactions rely heavily on quick response which is only achievable with MultiThreading and Parallelism. Thread is a simplified task (or process) and run by the main process. Meaning: a process can spawn some threads to do some work aside. For example: to download a file while the main process continues to do other things. In Java it's the Thread API. User's thread must derived form this API. The only difference is the instance Download. As a Thread each "download" produces an own instance. As a Runnable-Implementation the instance "download" can be shared and also an extension of an object other than object Thread itself. The most basic protecting mechanism of shared objects is a Synchronization between contenders. Synchronized objects are monopolized by one contender and the others have to wait as long as the objects are held by this contender. In Java it's the keyword synchronized. A single object (or variable) or a group of objects or a method can be synchronized. Without the keyword synchronized any modification could end up in unpredictable state. Now let check the functionality of synchronized and learn how it works. You may note that the elapsed time for 10000 synchronized threads is always more than 10000 unsynchronized. The reason is obvious: the counter is synchronized and that means: only ONE can access, the others have to wait while unsynchronized threads accessed wildly the counter without having to wait for the others. - FixedThreadPool(int NoOfThreads): it is useful if Tasks or Threads are small and have a long life. The NoOfThreads defines the number of threads that can be active and could ve simultaneously (or concurrently) executed. If the number of arrival threads exceeds NoOfThreads the newly arrivals have to wait until some active threads terminate. If there're more cores JVM cares about a balancing distribution of threads to each core (Parallelism.) How? JVM links Java Threads up with OS threads, but it is not very clear how JVM distributes a task or a thread to a certain core. - CachedThreadPool(): it's FixedThreadPool with NoOfThreads = infinite. CachedThreadPool is useful when the number of threads is excessive and the threads are short-lived (how short is your "rule of thumb"?). - WorkStealingPool(int NoOfCores): it's a variant of ForkJoinPool. Its target is parallelism. JVM does more work than just linking to OS-Core-Scheduling by checking the queue of each core. If, for example, core 1 has an empty queue and core 3 has too many waiting tasks JVM "steals" (hence "Stealing") some waiting tasks of core 3 and puts them into core 1 queue for execution. The mentioned ForkJoinPool is used to split a task (e.g. recursive task) into several subtasks which can be executed parallel. The "Stealing" act won't happen here. list.get(i).get(); // wait for the "future"
Now let rewrite the SyncThread.java using FixedThreadPool and see how "good" Concurrency works with JVM. 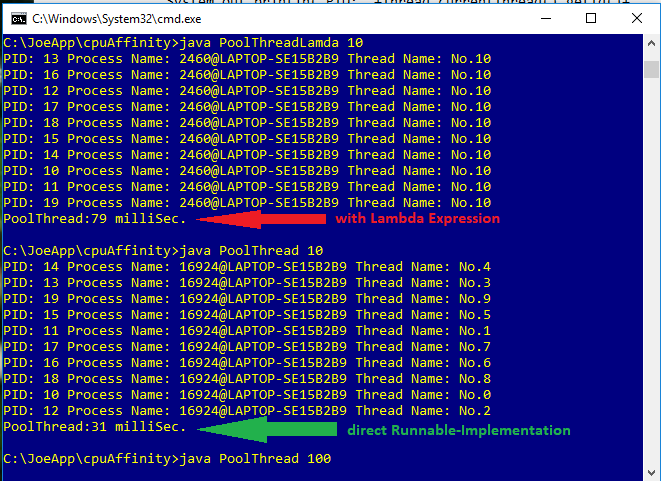 Note: SyncStealingPool.java: replace the line "ExecutorService pool = Executors.newFixedThreadPool(100);" with this "ExecutorService pool = Executors.newWorkStealingPool(Runtime.getRuntime().availableProcessors());"
Here you can see the significance of Concurrency: 46 mSec. (or 31 mSec. with StealingPool) versus 1742 milliSec. by 10000 concurrent threads. A factor of 37 or in other word: 37 times faster with Concurrency. You may ask what kind of application is best for concurrency, am I right? Pool is best for Webbrowser or Webproxy or DB-Server or any desktop application that requires a myriad threads or tasks to work concurrently or parallel. Example, a webpage is usually full of links which must be accessed. If a browser works conventionally link after link a full webpage could take minutes or hours and that is impossible for a user. With ThreadPool the accesses can be done concurrently and the waiting time for a full webpage is cutting down to seconds. Instead of using "synchronized" implicitly to lock and unlock object you can use the Lock Interface or implemented lock objects (e.g. ReentrantLock, StampedLock, etc.) of the package java.concurrent to do the explicit lock. Or you can develop your own locking/unlocking mechanism. For more details you'd study the API you work with. The beauty of Java is its single Inheritance and that means all Java objects are children of class Object which is also the foundation of concurrency. With the method wait() and notify() you are in a favorable position to build your own Lock & Unlock mechanism. An example of your own Lock/Unlock object. The advantage of self-developed Lock/Unlock mechanism is the versatility and its simplicity. 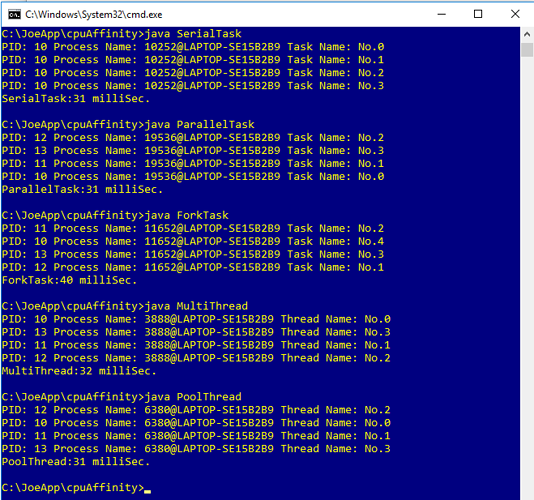 Now let modify ThreadPool_MyLock,java to ThreadPool_APILock.java using the Concurrent API ReentrantLock. What is "Reentrant"? In plain English: another entry variant (from to re-enter.) In Computer Science it's a safe continuation of execution in CPU exactly after a "long" interrupt. myLock.unlock(); // coerce to come back. For more information about other methods of ReentrantReadWriteLock and StampedLock you should take time and tinker with them so far that you get some feeling how they work. The atomic variables represent the primitives like int, long, double, etc. and are preceded by Atomic, for example, AtomicInteger, AtomicBoolean, AtomicLong, etc. Also: A lock-free thread-safe programming on single variables. Example: we rewrite ThreadPool_APILock.java (with ReentrantLock) using "AtomicInteger count" instead of "int count". the output is correct: 10000 ! With the function sched_setaffinity() developers can "pin" a certain process (or task/thread) on a certain core (or CPU) so that some prioritized app can be secured to be always executed. It's could quicken a certain app, but might worsen the performance of other apps because OS is usually optimized to balance the load equally on the cores. JavaThreadCore runs faster than KernelThreadCore because the last one has to load the Windows Kernel32 before it could access its services. Btw, with JNI it's more precise than PURE JAVA and looks "sophisticated", but with the tradeoff of less performance and OS-dependency. To run java CPU affinity you have to download this jna-3.2.5.jar: HERE or from CDJ.